North Carolina is dotted with small towns and larger cities. The Rescue Teams that protect these areas all have similar hazards to prepare for. Every jurisdiction in North Carolina has it’s share of water towers. Often seen as the identity of an area, these water towers offer many complex dangers and hazards for Rescue Teams to overcome. The most obvious danger is the extreme height. Less obvious is the lack of available anchors and control points. Lastly and probably most important is the confined space aspect of an elevated tank. 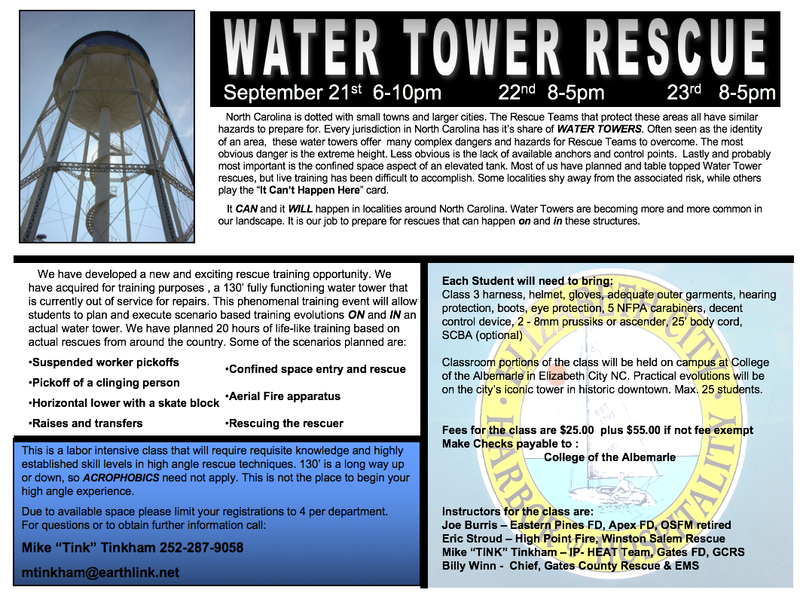 Most of us have planned and table topped Water Tower rescues, but live training has been difficult to accomplish. Some localities shy away from the associated risk, while others play the “It Can’t Happen Here” card. It CAN and it WILL happen in localities around North Carolina. Water Towers are becoming more and more common in our landscape. It is our job to prepare for rescues that can happen on and in these structures. This is a labor intensive class that will require requisite knowledge and highly established skill levels in high angle rescue techniques. 130’ is a long way up or down, so acrophobics need not apply. This is not the place to begin your high angle experience. Interested in volunteering? Learning new skills? Or giving back to your community? If so then you should consider turning in an application for membership. 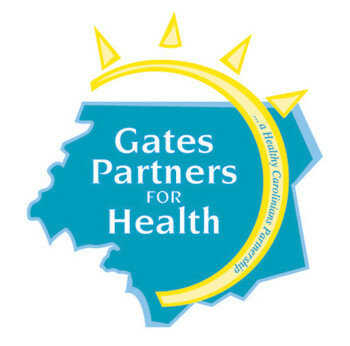 As a member you can accomplish all these goals, as well as, the opportunity to volunteer in other exciting areas. We are looking for new members now, trained or untrained. If interested in joining be sure to stop by our station, and pick up an application or click here to apply today! 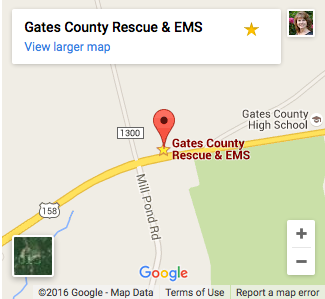 © 2005-2019 Gates County Rescue & EMS. All Rights Reserved.